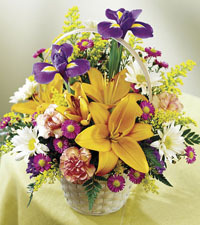 The nice thing about sending flowers in the spring is that there are so many beautiful varieties to choose from. 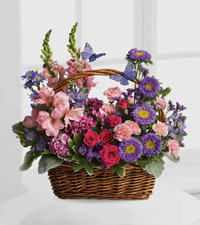 Nature’s Wonders Florist makes a point of carrying as many spring flowers as possible. 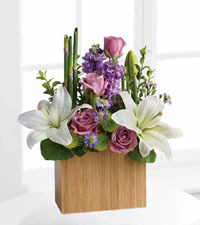 We believe spring in Vancouver is a magnificent sight and we seek to recreate this naturally beautiful season in our floral designs. 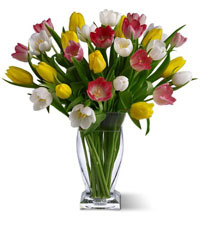 Our large selection of flowers available for delivery in Vancouver includes tulips, irises, daffodils, lilies, gerberas and so many more in our Shop by Flower section. 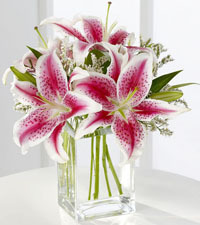 While these flowers all bloom for just a short period of time, they look incredible and smell even better! 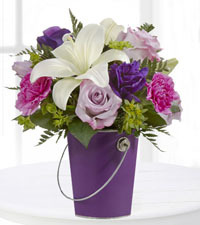 In addition to flower type, there are all kinds of colour choices available in each stem variety. 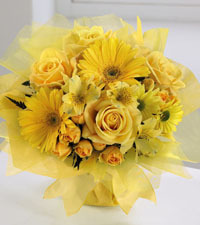 You are welcome to use our Shop by Colour section to see all the arrangements we've designed in a specific colour scheme. 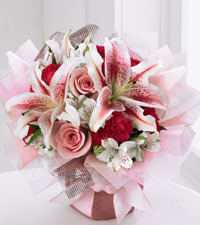 We very often create bouquets that are only made up of flowers in one colour like all white or all pink. 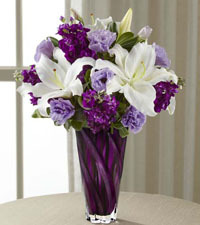 These monochromatic designs have become extremely popular in recent years and make wonderful gifts. 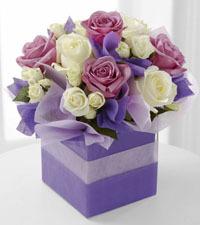 So whether you choose to shop by flower or by colour, both of these sections were created to make the experience of sending flowers easier and more focused on the likes of the person we are delivering to. 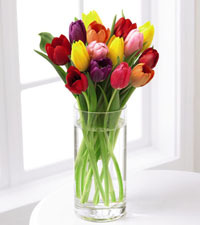 Spring is also the only time of year we see bulb flowers, like tulips, daffodils and iris. 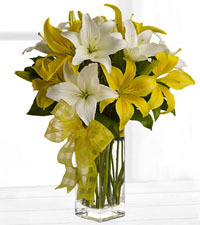 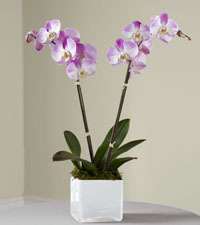 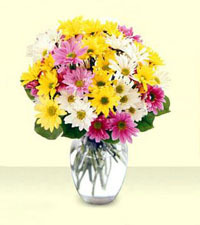 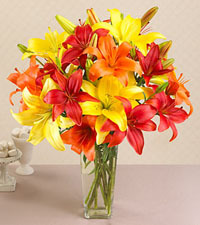 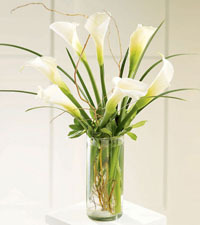 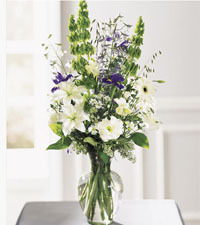 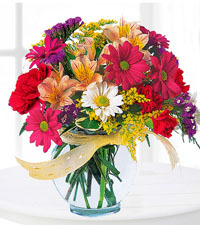 When in season, these flowers are extremely popular and are sent for a variety of occasions. 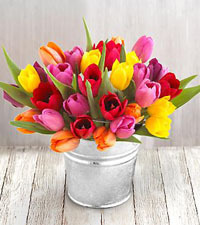 Tulips, for example, are a traditional spring flower that is bright, fun and available in all kinds of wonderful colors like red, pink, purple, orange, and yellow. 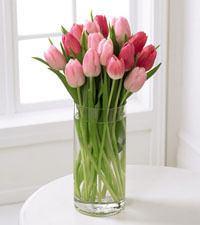 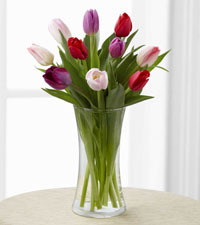 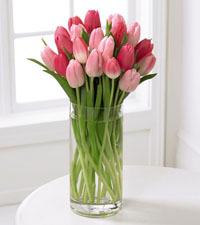 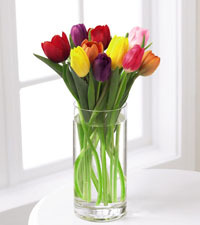 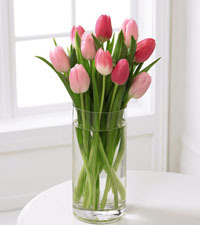 We find that tulips look their best when they are arranged in a clear vase without any greens, displayed in all their glory. 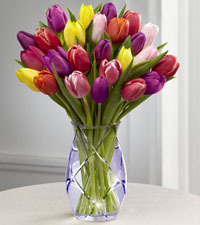 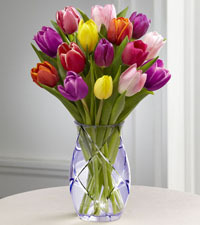 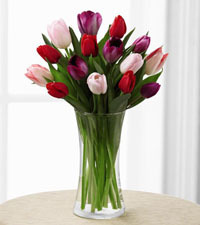 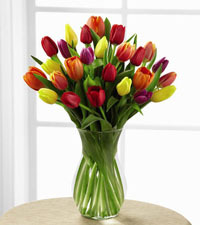 One of our most popular arrangements in this style is FTD's Bright Lights, a simple bouquet of ten mixed coloured tulips arranged in a cylinder vase. 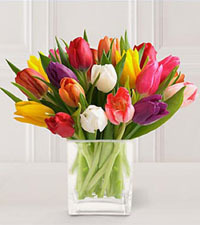 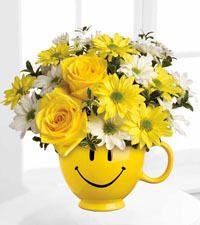 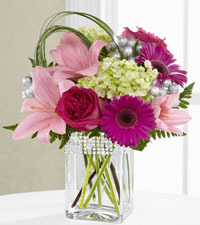 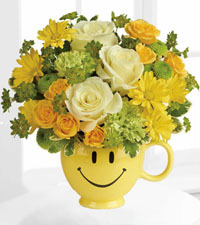 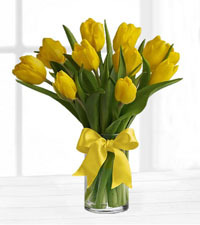 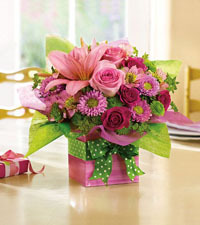 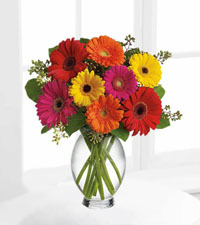 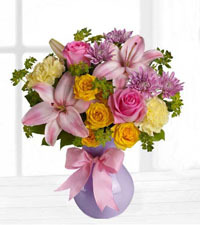 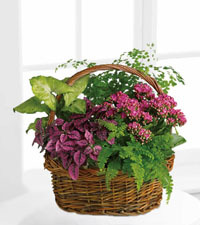 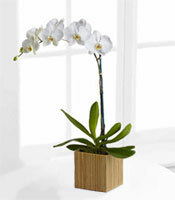 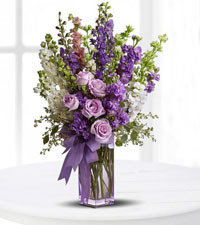 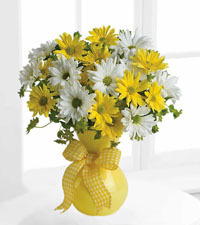 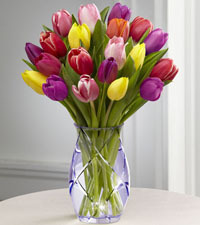 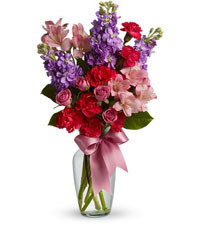 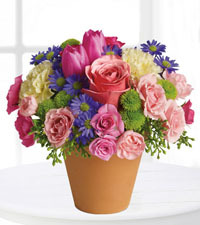 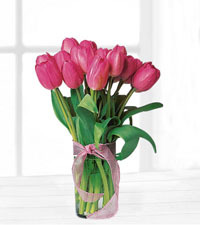 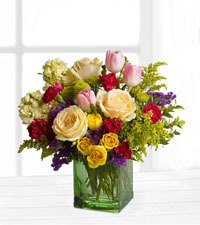 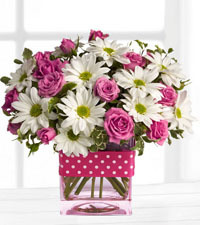 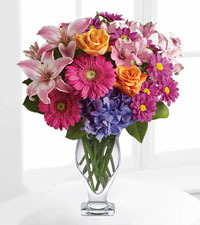 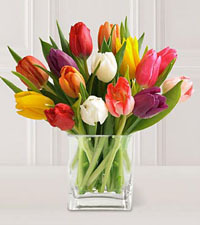 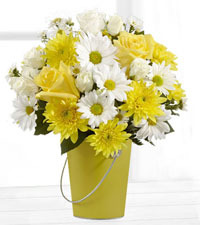 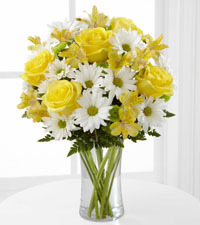 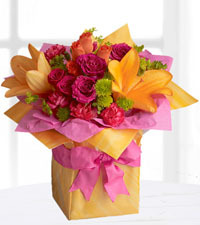 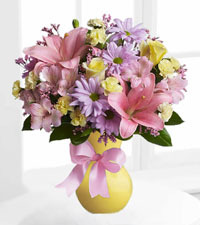 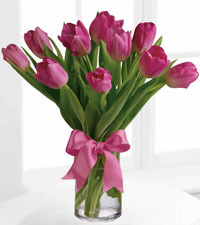 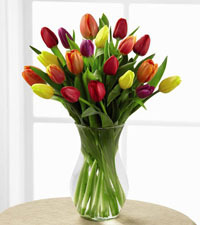 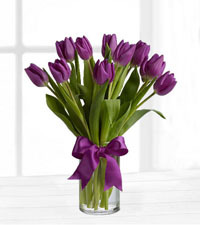 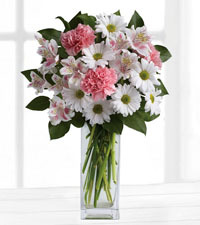 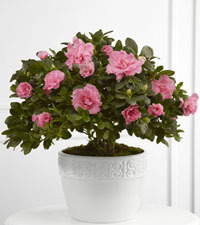 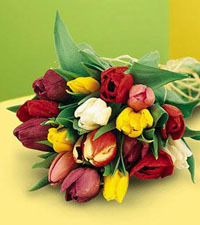 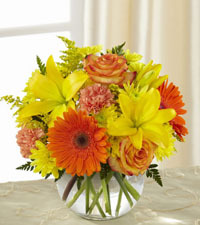 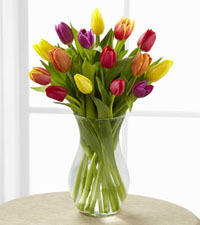 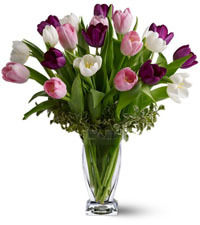 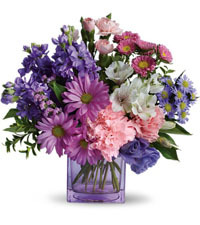 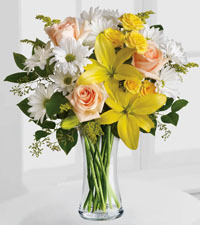 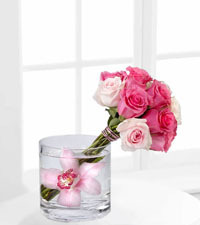 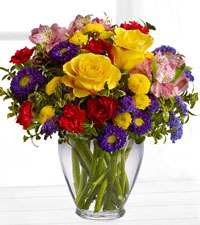 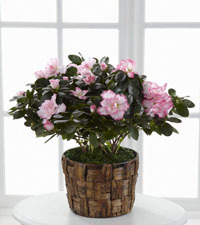 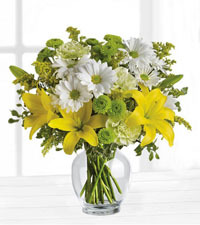 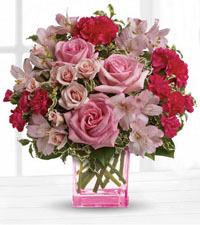 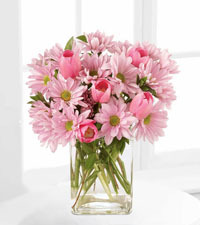 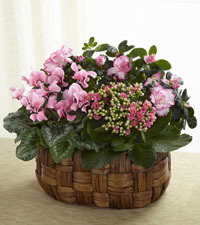 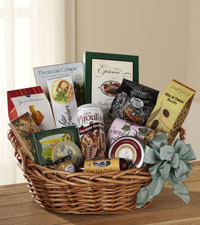 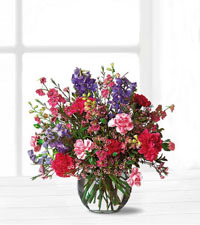 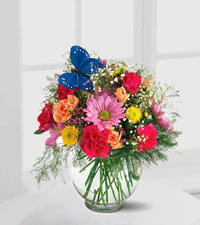 This wonderful spring gift is sure to brighten any one's day when delivered to their door. 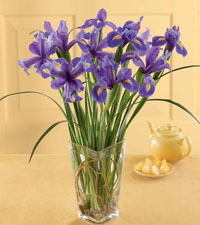 The iris is also a popular choice for spring and is another beautiful bulb flower we carry in our Vancouver flower shop. 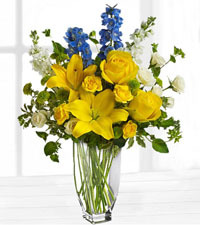 It is one of the first flowers to bloom after the snow melts and is striking in its bright blue and yellow tone. 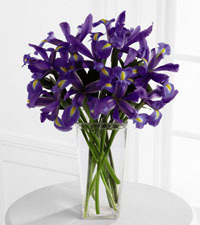 The iris is one of the most requested flowers during spring and is included in a number of floral arrangements available on our website. 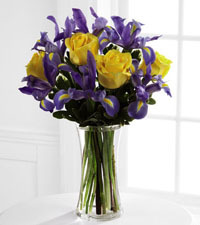 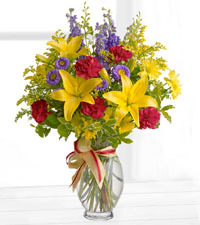 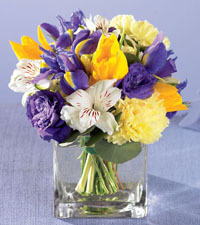 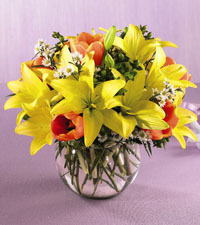 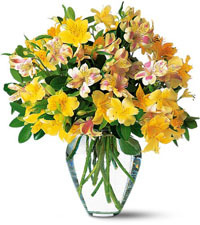 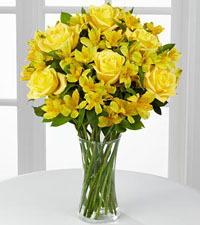 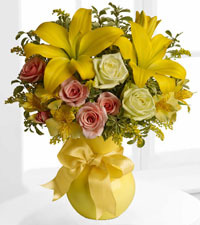 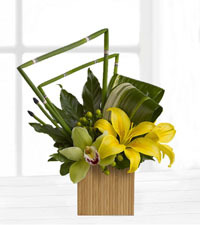 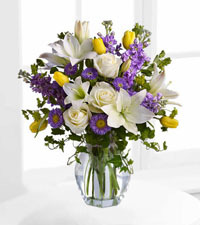 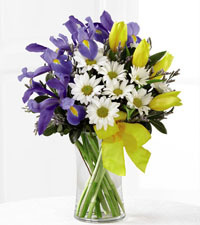 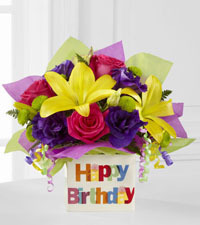 Sunlit Treasures Bouquet includes a number of iris stems that are accompanied by sunny yellow roses. 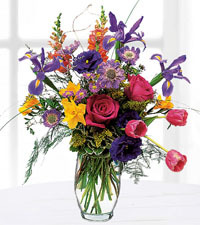 This stunning combination makes the iris the star on the stage in this arrangement. 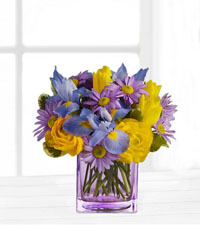 It is a perfect gift for anyone who loves blue flowers and a perfect way to usher in spring in Vancouver. 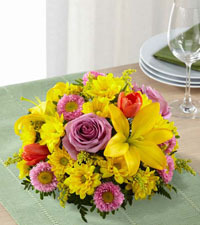 One of the special holidays many people like to celebrate in spring is Easter. 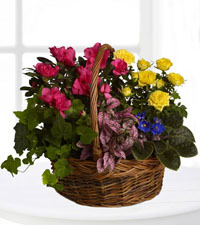 We offer a number of floral selections suitably designed for this holiday and tend to deliver a number of blooming flower baskets during this time. 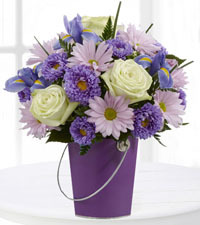 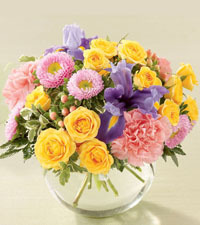 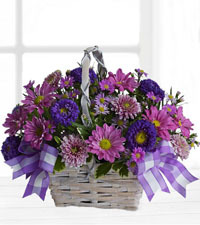 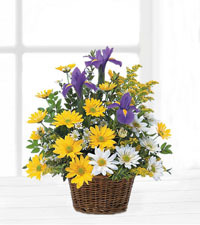 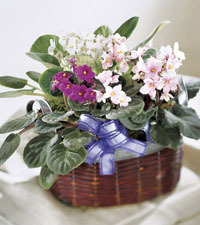 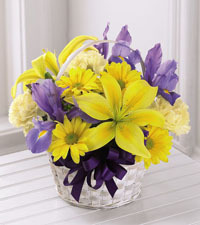 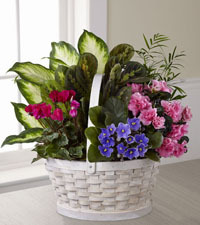 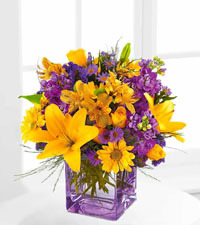 The Spirit of Spring Basket, is a wonderful Easter selection with its brilliant combination of purple and yellow flowers. 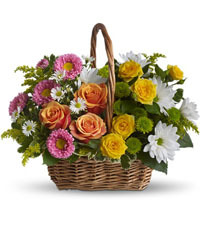 This typical basket arrangement is arranged in a cute handled basket, topped with a matching bow and is certain to be a hit with your loved ones when delivered to their door. 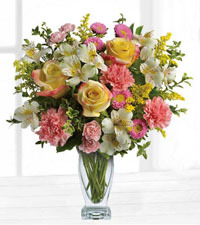 Another fantastic choice for Easter would be Teleflora's Garden Centrepiece, a great display of pastel toned flowers designed to be accent any family gathering. 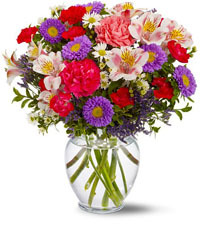 If you are browsing for great spring flower ideas for Mother's Day, make sure you check our extensive collection of spring flower bouquets available for delivery in Vancouver. 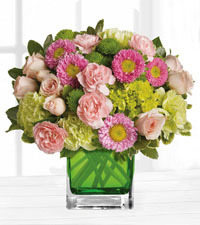 Mother’s Day is an important time of year, and we would like to help you send beautiful gifts to your mother and other important women you want to recognize. 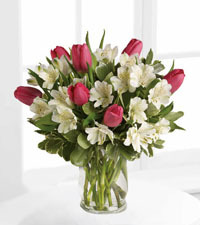 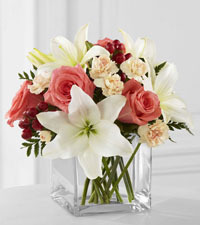 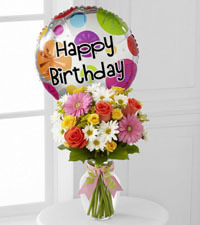 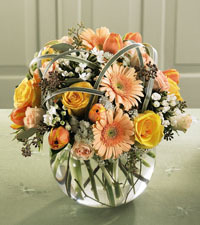 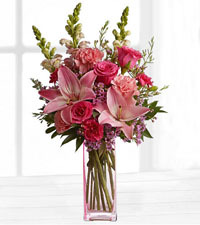 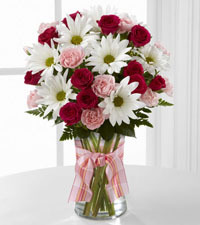 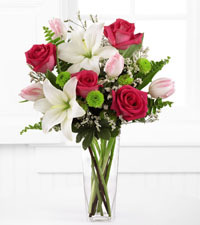 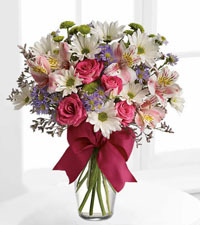 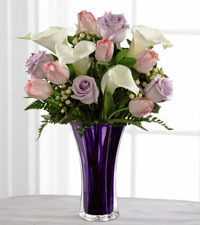 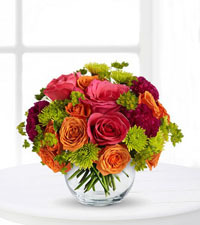 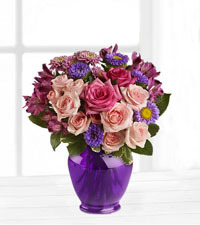 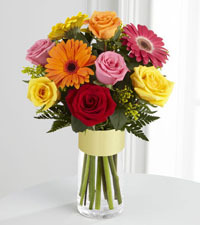 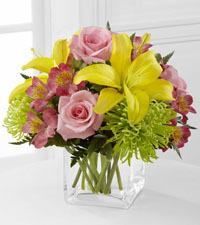 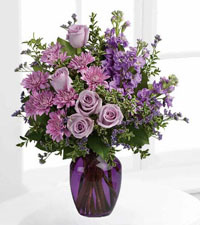 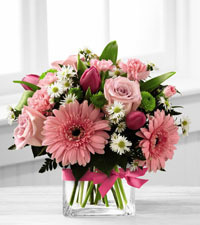 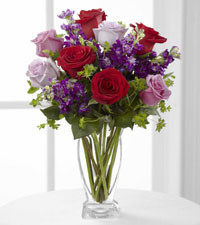 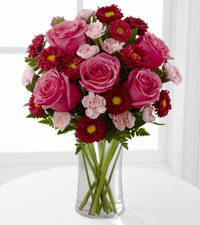 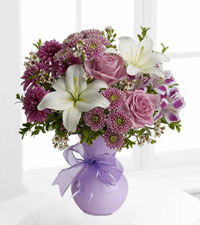 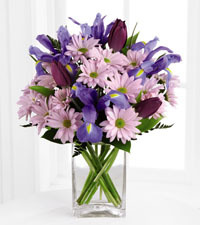 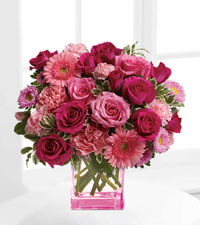 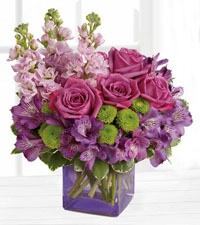 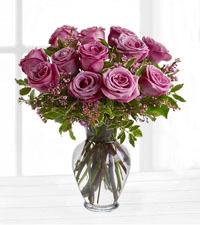 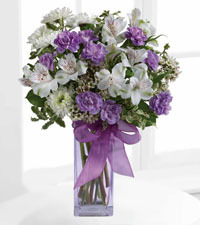 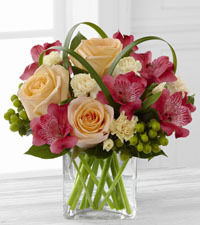 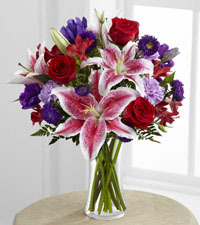 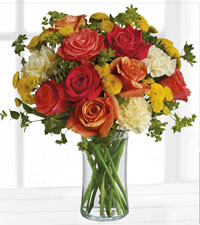 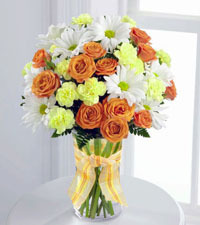 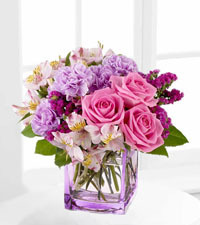 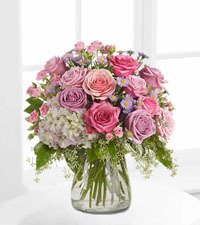 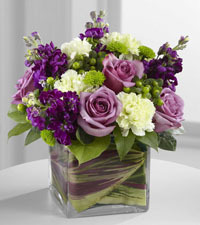 Honour the women in your life with an arrangement like FTD's Garden Terrace Bouquet. 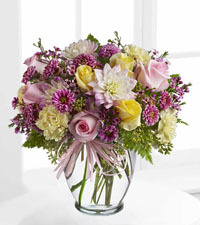 This brand new design is one of the most appropriate arrangements for Mother’s Day we have ever offered. 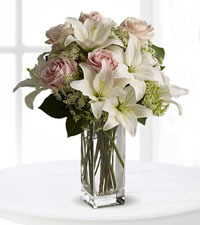 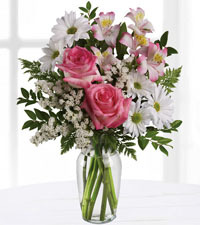 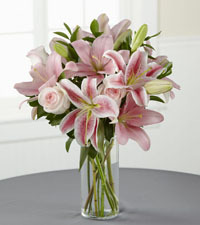 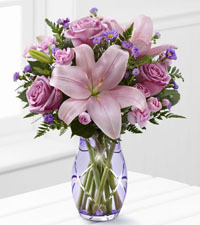 It includes pink roses, plum carnations and white lilies. 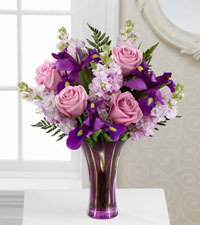 Gorgeously arranged in a designer cut glass vase, this vivid representation of fabulous feminine colours is sure to be well received. 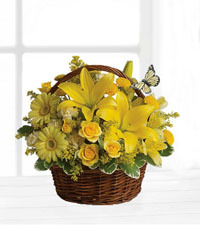 In addition to the more traditional bouquets delivered in spring, we also have some more unique gifts ideas like our Welcome to Spring Wreath. 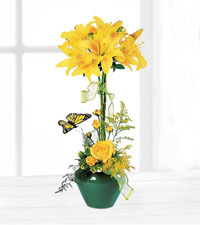 Designed to be hung on a front door, this lovely spring gift has yellow roses, and some chrysanthemums that are green that really make it stand out. 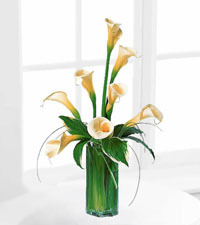 Combine these with some white daisies and what you are left with is a beautiful spring piece that is sure to wow your recipient every time they open their door.